Indeed, marriages are formed in the skies as sometimes the most-rare people meet to form a couple. Who could have thought that the King of Malaysia would get married to Miss Moscow? 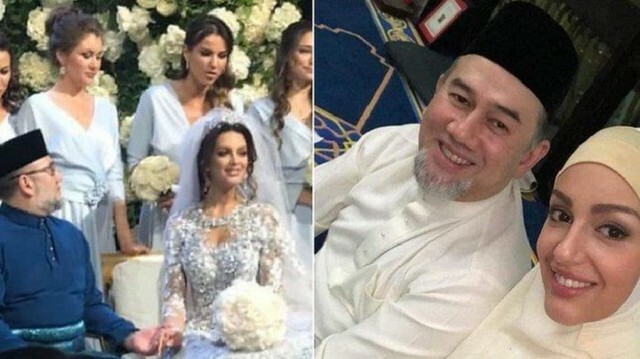 Oksana Voevodina: The former Russian beauty Queen of Moscow converted to Islam to marry the King of Malaysia and is now titled as the Queen of Malaysia. The 25 years old beautiful former Miss Moscow, Oksana Voevodina, married the King of Malaysia. Russian model Oksana Voevodina, 25, had a screen name Nikol on the programme five years ago, according to the country's biggest newspaper. King Muhammad V of Kelantan: The King of Malaysia named King Muhammad V of Kelantan, came to power in 2016. He is 49 years old. The couple got married at a royal wedding ceremony that took place according to Islamic values in Moscow. The Wedding Ceremony: According to the reports, the food and drinks served to the prestigious guests were halal. No alcoholic drinks were served. The wedding took place on Islamic grounds and depicted a pure Islamic marriage. The current queen of Malaysia, Voevodina, converted to Islam earlier this year in April. Her previous religion is not clear and disclosed, yet she is currently a practicing Muslim. She converted to Islam to marry the Muslim Monarch. Malaysia is a Muslim majority country whose constitution proclaims that Islam is their official religion. As per the Constitution, the federation’s official religion is Islam, yet other religions can be practiced in peace and harmony. According to the constitution of the state, the King or the ruler is to act as Head of the Islamic religion. More about the First Lady of Malaysia: According to some of her previous interviews, the First Lady of Malaysia is a graduate Plekhanov Russian University of Economics. In 2015, she won the title of Miss Moscow. She went to China and Thailand to work as a model. According to her when she was in School, she was worried as she was the tallest and the slimmest in the class. Yet when she entered the University, she sought that this was her strength, not weakness. Her looks were something that attracted the young ones to her. Something about the Malaysian King: Some reports claim that the King was previously married to a Malay royalty but divorced her in 2008. He has studied at the prestigious Oxford University. He has also attended the London’s European Business School. We wish the couple a beautiful life ahead full of joy!